If You’re In The Market For Sound Control Doors, Then Nothing Compares To The Stellar Performance Of Acoustic Sound Proof Doors And Steel Frames. They Truly Set The Global Standard For Sound Transmission Loss, Making Them The Best Soundproofing Door In The Market. Each Door And Frame Has Been Tested As A Unit And Is Supplied With Acoustic Perimeter And Bottom Seals. Stock Acoustic Soundproof Wood Doors And Steel Frames Are Ready For Immediate Shipment. Soundproof Doors Are Available 1 3/4″ Thick From STC 33 To STC 50.Our Acoustic Wood Soundproofing Doors Are Ready For Immediate Shipment. Doors Are Available In 1 3/4″ Thickness, From STC 33 (Fair Performance) To STC 50 (Excellent Performance), And At A Greater Thickness From STC 51 To STC 54. See Below For A More Detailed Explanation Of South Transmission Class, Or Click On The Following Link. 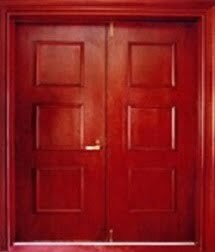 Our Sound Proof Doors Are Available With A Variety Of Paint Grade Or Stain Grade Face Veneer Options Including Birch, Oak, Walnut, Maple, And Cherry, Door Edging Matching The Veneer Of The Door Face. They Are Also Available With Factory Pre-Installed Acoustic Glazing. Testing Of Our Sound Proof Doors And Frames Have Been Conducted By Independent Laboratories And Complies With The Most Up-To-Date Standards Available. They Are Designed To Accept Readily Available Heavy Weight Builder’s Hardware. Our Customer Service Representatives Will Help You Determine The Best Acoustic Wood Soundproofing Door For Your Project Or Facility. We Factor In Your Environment, Any Existing Requirements/Standards, As Well As Your Budget, To Match You With A Soundproofing Door That Meets, And Exceeds Your Expectations. Come Learn Why We Are The Premiere Steel Commercial Door And Hardware Provider In South Florida. If You're In The Market For Sound Control Doors, Then Nothing Compares To The Stellar Performance Of Acoustic Sound Proof Doors And Steel Frames.